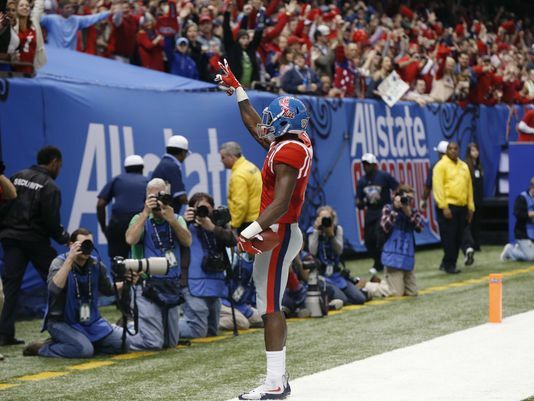 Shirts With Random Triangles: Laquon Treadwell Is An Ex-Ole Miss WR, Will Enter 2016 NFL Draft. Ole Miss head coach Hugh Freeze described the experience of having coached Treadwell as "an honor, and that "The commitment that he and others in his class made to our program three years ago has changed the culture of Ole Miss. I’m so proud of what he accomplished here, and I look forward to seeing him continue to grow and shine as a player and a person"
Treadwell set multiple school records at Ole Miss, including single-season records in 2015 for most catches (82), receiving years (1,153), and touchdowns (11).